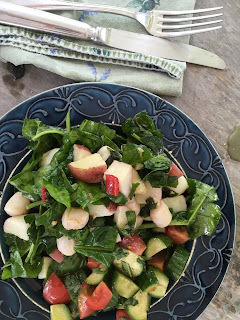 I’m on a wilted salad kick these days, they’re summery, easy, and I love the mix of warm and cold. Cut some red potatoes into half inch chunks and simmer in a pot of salted water until just tender. Drain and set aside. Slice up some bacon and cook over medium heat in a large skillet with a little bit of olive oil. Next, add a minced shallot along with some sweet red pepper. When the bacon starts to brown stir in some bay scallops and minced garlic then cook until the scallops are cooked through. It doesn’t take long. Immediately transfer the hot mixture, along with the potatoes, into a large bowl of raw spinach and toss with olive oil, lemon, and salt and pepper to taste.